Removing Internet Explorer on system with Windows XP or Vista isn’t easy. After several attempts of removing IE, one can end up with unstable and corrupted Windows. Well, this could change all together in upcoming Windows7 with official option to remove Internet Explorer8. 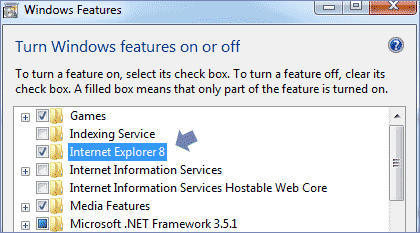 In Windows7 there is option to remove Internet Explorer8 under Windows Feature dialog box. In Windows7 goto Control Panel > All Control Panel Options > Programs and Features (click UAC prompt). Then uncheck Internet Explorer8 in the list. As pointed by AeroXperience, whole process takes two reboots and a configuration step to complete. Good beginning for those who dont want IE and prefer Firefox or Opera – what say?